The bitterly cold wind numbed my cheeks, stung my eyes, and blasted my half inch of exposed forehead with an ice cream headache. Happily, the sun was shining and the rest of my body—entombed in layers of wool and down—remained a comfortable temperature. As they say, there is no bad weather, only bad gear. I felt adventurous to be out walking on this sub-zero day, even though the temperature had risen a full 14 degrees from -17 to -3 degrees Fahrenheit. With the wind at my back, an ethereal sunset glowing on the horizon, and a warm house waiting less than two miles ahead, I decided to take Duluth’s Lakewalk along the shore of Lake Superior. Ice and snow mingled with rocks on the beach, and although no ice floated in the lake, the water looked frigid just the same. NOAA data shows that the temperature in this corner of the lake is about 40.5 degrees, which is just a tad warm for late December. As I rounded the corner by Endion Station, I was surprised to see life. Dozens, maybe hundreds, of mallard ducks huddled in rafts along the leeward shore, the iridescent green heads of the drakes shimmering handsomely in the last rays of sun. They looked especially dapper against the pure white patterns of ice-draped riprap. The presence of this concentration of life somehow made the afternoon feel warmer. Don’t ducks migrate south for the winter, though? Well, as with so much in nature, it depends. 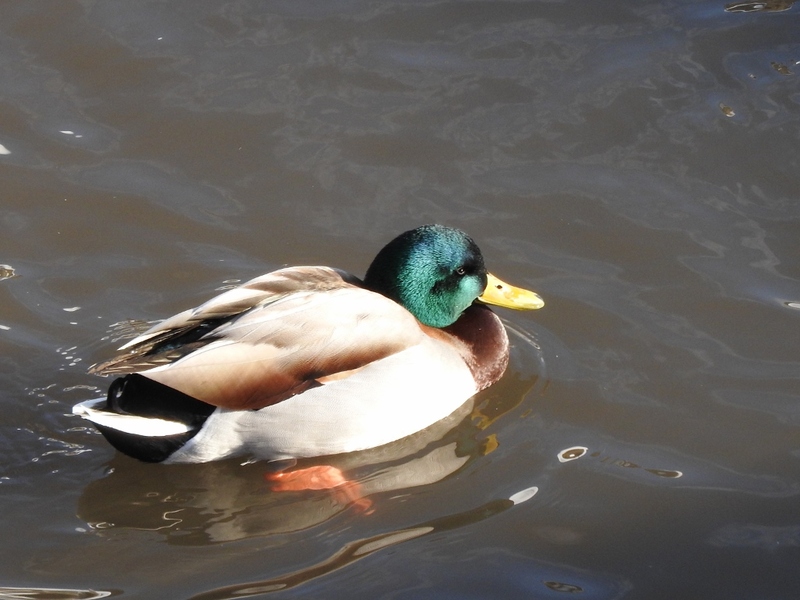 Mallards are medium-distance migrants, who only go as far south as needed. Some do fly all the way down to Mexico and the Caribbean, but many seem to prefer a “staycation.” About 1,500 mallards even make Anchorage, Alaska, their year-round home! As long as the ducks can find sufficient food, they can withstand some pretty brutal winter weather. In species of songbirds who are medium-distance migrants, such as red-winged blackbirds, and juncos, it tends to be mostly males who overwinter farther north. For them, being the first back on their summer breeding territory is of utmost importance. Continuing up the ramp to where the path parallels the railroad tracks, I looked down into a small pool—hidden in the riprap—that seemed to be at the outlet of a culvert. Here, out of the wind and in water that was potentially slightly warmer, ducks carpeted every surface. Pulling my scarf up over my windward cheek, I stopped to watch. Some ducks floated with their beaks and heads tucked backward under their wings. My rosy nose was envious. Other ducks paddled idly in circles, perhaps a little off-kilter because one foot was being warmed up in their feathers. Occasionally one or two ducks would start dipping their heads quickly and letting the water slide cleanly off their backs. It didn’t match the feeding behavior I’ve come to expect from dabbling ducks: pointy tail sticking straight up in the air for several seconds while their beak probes the bottom. Mallards use a similar dipping motion in their courtship rituals, but that looks more like a head bob than this dolphin dive. It reminded me of how I feel in an outdoor hot tub, constantly submerging myself in the water to stay warm. Could it be that the ducks are using the “warm” water (more than 40 degrees warmer than the air!) to help maintain their body temperatures? 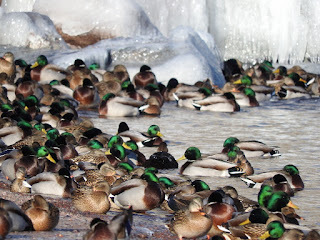 Plenty of ducks weren’t even in the “warm” water; instead they huddled on a small shelf of ice at one end of the pool. They looked cold. But looks can be deceiving. Mallards are big-bodied ducks, and well able to maintain their 100-degree body temperature. All of our winter parkas imitate their fluffy, warm, down feathers protected by a waterproof shell. We can’t even come close to imitating their feet, though. Not only are webbed duck feet adapted to swimming, they are adapted to manage heat loss as well. 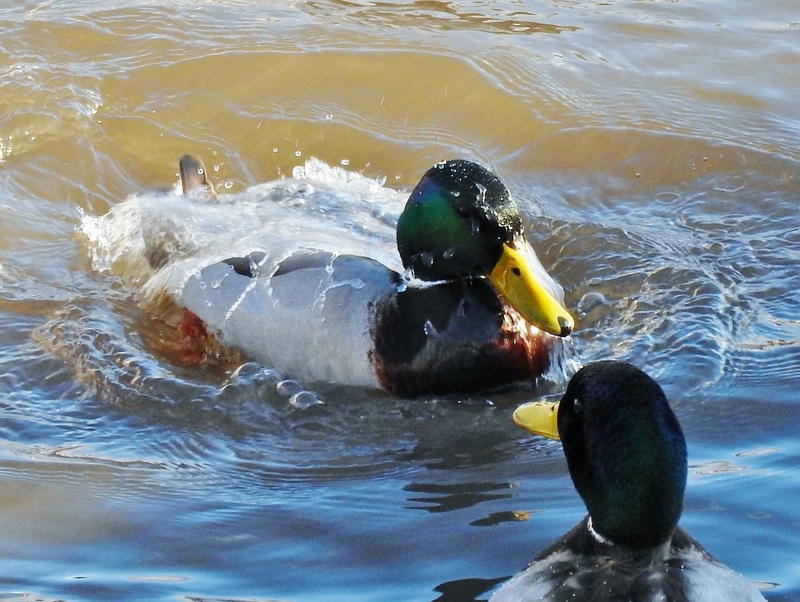 Mallards have blessedly few nerves in their feet. They don’t seem to feel the excruciating pain of too-cold toes warming up. The discomfort that humans feel is actually a helpful adaptation, though, and inspires us to warm up our feet or hands before they are damaged by the cold. Ducks don’t need that motivating pain to keep their feet safe. They have a net-like pattern of veins and arteries in their feet, called “rete mirabile,” which is Latin for “wonderful net”. This wonderful net allows cold blood returning from the feet to be warmed up by outgoing blood before returning to the body. Ducks will increase or decrease blood flow to protect against tissue damage while losing as little heat as possible to the environment. They may not feel as cold as they look! 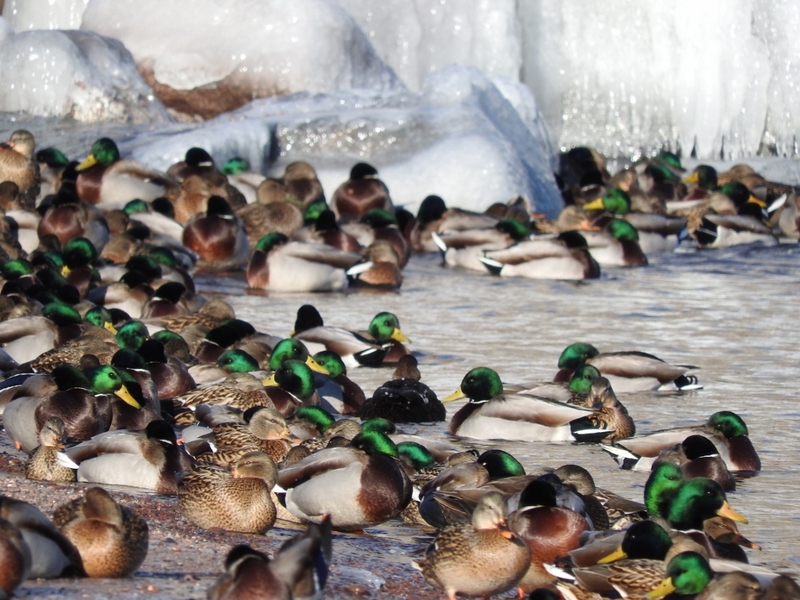 Flocks of mallards in the open water near Duluth are a common winter phenomenon, at least in recent memory, and they seem to have the adaptations to handle an Arctic blast. I think they probably would agree that there is no bad weather if you have the right gear. For over 45 years, the Cable Natural History Museum has served to connect you to the Northwoods. Come visit us in Cable, WI! Our new phenology exhibit: “Nature’s Calendar: Signs of the Seasons” is now open. Perfectly firm, freshly groomed tracks cradled our skis. Bright sun warmed our faces despite an occasional breeze. A sinuous, brown and white river caressed our looping length of trail. And a half-tunnel of arching tree branches cupped us in their arms. 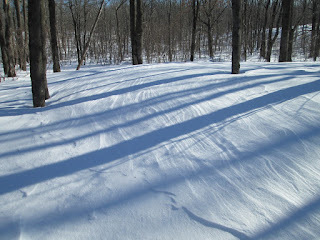 The River Trail at ABR ski touring center in Ironwood, MI, was treating us well for this first long ski of the year. I paused at an intersection to let my companions catch up, and found myself admiring a line of trees perched on the bank of the Montreal River. Each tree was actually a cluster of trunks, united at the base and spreading gently out toward space and sunlight like a giant, woody bouquet, with bright snow accentuating each curve. Round, red buds adorned the tip of each oppositely arranged twig, giving its crown a polka-dotted look. Gliding up, Abett asked about the tree, and I shared “silver maple” as my identification. We all admired their form. 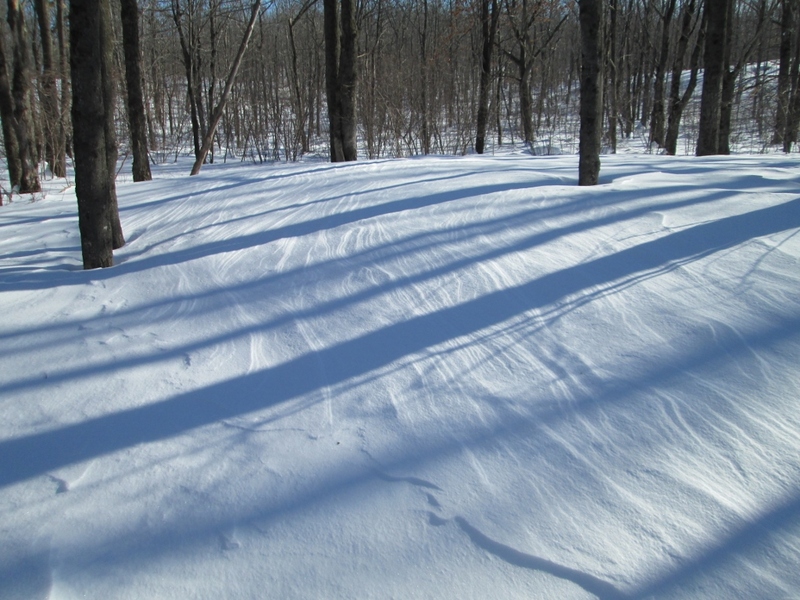 Silver maples are classic floodplain trees in Wisconsin, and this wide, flat area along the Montreal River is perfect habitat for them and for easy ski trails. In its other reaches, the Montreal River cuts through cliffs, crashes over waterfalls, flows under the deep shade of conifers, and pours out on to a rocky Lake Superior Beach. The Ojibwe name for the river is Gaa-waasijiwaang, meaning “where there is whitewater.” It’s true that most of the water I see is white, but for a different reason. Here, (as far as I can tell under the snow) it meanders through alder thickets and grassy meadows that are soggy when not frozen. While the dark, tannin-stained waters of the river look innocuous where they peek out through holes in the ice, they probably aren’t always so well-behaved. I cite the trees as my evidence. The tight grouping of trunks exhibited by these silver maples is a common form among floodplain trees, and is shared by basswoods, too. Silver maples drop their helicopter seeds (the largest of any maple) in the spring. The seeds may get a wild ride to a new home if there is a flood, and the well-provisioned little explorers germinate immediately. In the moist, rich alluvial soil of the riverbank, they might spend a season or several growing straight, tall, and independent. Until another flood comes. Debris, logs, and even ice churn down the river and over its banks. The little tree doesn’t have much of a chance. Luckily, silver maples—especially small trees less than a foot in diameter—can resprout prolifically from their stump or root crown. With an established root system already in place, I bet the second round of sprouts grows even faster than the original. By the time the next flood hits, the trees are already in defensive position, with the upstream trunks shielding the downstream trunks from damaging debris. The roots of a silver maple aren’t just important for resprouting after damage. Any plant that lives near water needs to be adapted to having its feet wet. Even roots need oxygen in order to carry out respiration and grow. On the other side of the trail, a thicket of speckled alders takes in extra oxygen through the many lenticels (“speckles”) in their bark. They transport that oxygen to their roots. 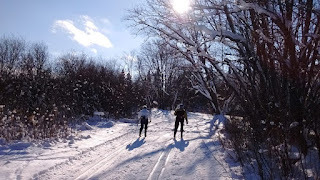 Earlier, we’d skied under a big, arching willow tree with its gnarled branches and graceful, yellowish twigs reaching all the way over the trail. Willows also use lenticels to breathe. Silver maples take a different route, and send a shallow root system near the surface where there is more oxygen. Despite growing right next to the river, these silver maples were actually perched on slightly drier soil than you’d find a few yards inland. When a river floods, the moment its water spills over its banks, it slows down and deposits the biggest pieces of its suspended load—sand. This process builds a raised bank—a natural levee—between the river and its floodplain. So, instead of dipping their toes in the soggy muck beyond, the silver maples lined up on the natural levee can take advantage of both well-drained (and oxygenated) sandy soil, and the proximity to water. Meanwhile, their fortress of trunks protects them from the river’s fury. This is yet another example of teamwork in a forest. 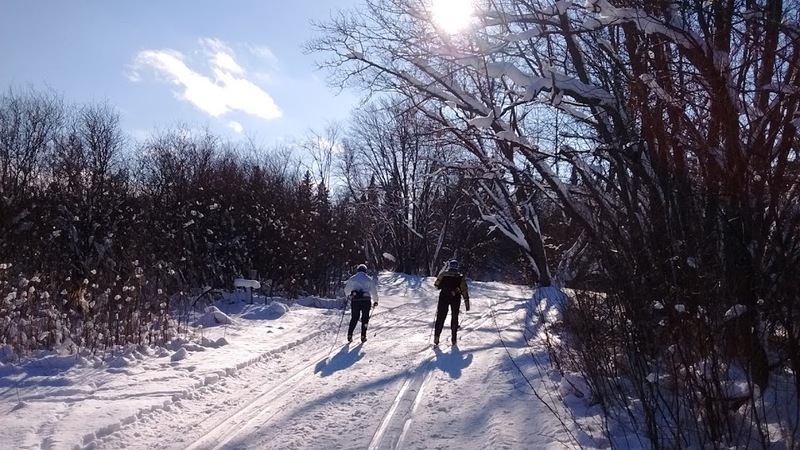 Our little team of skiers continued on shortly, after exclaiming a few times about the beautiful weather, the perfect grooming, the fine company, and this gorgeous scenery. There wasn’t a cloud in the sky, but our ski even had a silver lining. Big, fluffy, wonderful snowflakes swirled around my head and the stiff breeze sent icy fingers down my neck. Slamming the car door against the storm, I started the engine and wished the temperature gauge would rise above cold so I could turn on some warmth. My cross country skis were rattling around behind me—ready, but unused—so I was ecstatic about this storm, but the cold was still a shock to my system. Rolling along the highway at a relaxed, “get-there-safely” pace, I enjoyed the scenery’s face lift. Drab, brown fields have been transformed, and the forests are delightfully frosted. Tawny, dried weeds and their dusky shadows painted texture on the roadside border, which gave way to glittering fields of smooth white. Suddenly, those colors came alive in a cloud of swirling beauty. Brilliant white, sharp black, brown, and blur; the flock of snow buntings ascended, swooped as if tossed by blizzard winds, and flashed their colors in unison as I passed. 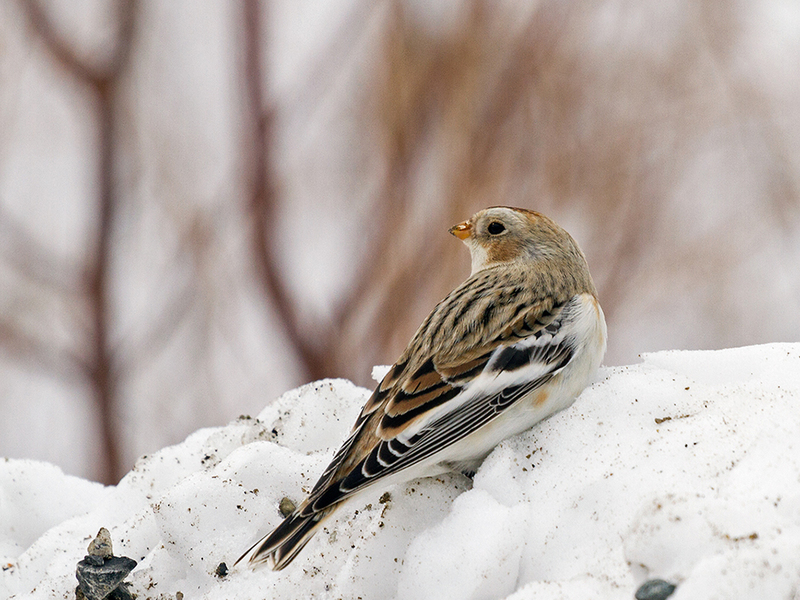 The warm brown srtipes on snow buntings are only temporary, and are confined to just the tips of feathers. All winter, the male rubs his feathers on the snow, wearing off the brown tips and revealing his dapper white and jet black courting suit by the time breeding begins. Females also rub off most of their brown tips. Photo by Charles J Homler, creative commons. These tough little visitors from the Arctic live up to their nickname of “snowflake birds.” They nest on tundra all around the top of the globe, and are the most northerly recorded songbird in the world. In fact, one scientist claims that “Under the current climate conditions of the Arctic, there is no northern range limit for snow buntings.” There is a southern limit to their range, though, since a certain amount of daylight is essential to their reproductive success. They also require the average temperature in July to stay below 50 degrees F. That may sound unpleasant to you, but it comes with midnight sun, a warm down jacket, and the stark beauty of places like Ellesmere Island, Greenland, Norway, and Siberia. In winter, some snow buntings (especially females) head as far south as Iowa or Utah, but some (especially males) migrate only as far as northern Canada. Moderate cold isn’t an issue. They can survive in temperatures down to -40 degrees F. Only when it gets down to -58 degrees F does their body temperature start to plummet. The solution? Dive into a nice, warm snowdrift. The insulating power of snow helps preserve their body heat and keep out the wind. My toes get cold just thinking about it, but feathered feet allow snow buntings to spend most of their winter strutting about on the chilly drifts. They usually feed in big, gregarious flocks that seem to roll along chaotically as the birds in the back make short, fluttering flight to the front. Occasionally, the whole group will rise and fall in a flurry of motion at the suspicion and passing of danger. Feeding flocks are entertaining to watch, since these birds don’t submit to a defined hierarchy like chickadees do, and end up bickering continuously over seeds and space. Deep snows cover up the seed heads of short tundra plants in their breeding territory, but here in Wisconsin, snowplows expose seeds in the gravel shoulder, and windswept fields of nodding stems offer good foraging, too. I was particularly happy to read that they eat seeds of the ragweed plant, which is a major cause of seasonal allergies! Naturalist John Burroughs wrote that snow buntings have “plumage copied from the fields where the drifts hide all but the tops of the tallest weeds, large spaces of pure white touched here and there with black and gray and brown.” But some colors are only temporary, and are confined to just the tips of feathers. All winter, the male rubs his feathers on the snow, wearing off the brown tips and revealing his dapper white and jet black courting suit by the time breeding begins. This is an odd way to get dressed, for sure, but it saves valuable energy that would be spent on the usual second molt. And energy is at a premium in spring. Snow buntings must gain at least 30% more body mass before beginning their northerly migration, and individuals without adequate energy storage don’t seem to be able to “select seasonally appropriate directions during their migration.” In other words, skinny birds can’t find their way home. Perhaps this keeps them in warmer regions until they have gained enough strength to migrate. The ones that do head north fly at night and use the geomagnetic field of the Earth almost exclusively for wayfinding. Visual clues are of little use to them in the blank, white of the tundra. Males arrive on their breeding territories in early April, when temperatures can still drop to -22 degrees F. They have to arrive early to secure a good territory, since the cracks and cavities in rocks where they nest are a finite resource. Females, sensibly, arrive six weeks later. He woos her by singing fast and often—a signal that he is an efficient forager and has ample free time for lovesick serenades. That’s important, because she must incubate the eggs almost continuously to keep them warm in the cold rocks, and relies on a fast-foraging male to feed her during that period. Arriving at the trailhead, I emerged into the swirling flakes, clicked into my skis, and attempted to embody the spirit of our tough, adaptable snowflake birds. Winter is coming in fits and starts. Last week, a thick, white blanket of snow separated each stoic tree trunk. Then it melted. 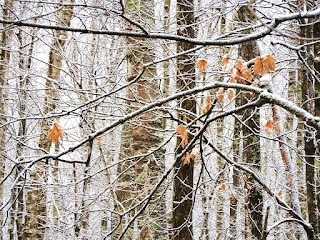 This morning, a thin frosting of damp flakes swirled out of the sky, outlining every feature of the forest floor, highlighting the trunks and tracing the twigs. The intricate patterns, thus revealed, give us just a glimpse of the complexity that lies beneath. Yes, the roots of the trees ramble widely, and fuse with relatives to form a Wood Wide Web that shares resources, but the connections don’t stop there. Light snow traces the complex network of twigs in the forest, and we can imagine an even more intricate web of roots and fungi living below the surface. Photo by Emily Stone. Fungi pick up where the roots leave off. Most tiny root tips are colonized by filaments of fungi, which extend the plants’ reach into the surrounding soil. Each tree species can host multiple types of fungi, and each fungus can colonize a variety of plant species. This expands the network beyond the species-specific root grafting, and creates a mycorrhizal (myco=fungus; riza=root) network that is robust and thickly woven. So thickly, in fact, that scientists say you could find seven miles of fungal hyphae in a pinch of dirt, and hundreds of miles under a single footstep. In addition, this pattern creates resilience. With just a few important hub trees (or airports), there is a lower likelihood that one of them will be damaged. If one of the less-connected trees dies, the impact on the ecosystem isn’t large. However, in the infrequent event that one of the few hub trees dies, the impact on the connectivity of the surrounding forest could be dire. That’s why conservationists and foresters must focus on identifying and preserving the venerable elders. Trees and mycorrhizal fungi live in an incredible symbiosis. Trees feed the fungi sugars produced during photosynthesis, and may share up to 80% of their total production. In return, fungal hyphae increase the absorbing area of roots from 10 to 1000 times. This protects trees against drought by contributing to water uptake and storage. Fungi don’t just absorb nutrients; they actively break down tightly bound soil nutrients like phosphorous and iron and make them available to plants. Some fungi even recycle nitrogen from soil nematodes into their plant hosts. Fungi and trees feed each other, and the intricate web captures and holds nutrients before they can be lost from the system. The benefits aren’t just food related. The sheath that a fungus forms around a root creates a physical barrier against diseases. Meanwhile, it is diverting heavy metals and excreting antibiotics designed to kill pathogens. At a community level, the fungi act like fiber optic cables. Using warning chemicals and electrical impulses, they help trees share information about insects, drought, and other threats, so that currently unaffected trees can prepare their defenses in advance of an invasion. What’s more, the mycorrhizal fungi can facilitate nutrient sharing between trees and plants of different species. Dr. Suzanne Simard traced the flow of radioactive carbon 14 from birch to Douglas-fir trees. After only an hour, she found evidence that birches had incorporated the carbon 14 into sugars during photosynthesis, and then shared it with nearby firs (which had been shaded for the experiment). Later, after leaf-off, she found that the evergreen firs were providing sugars to the twiggy birches. Why would the fungi benefit from distributing resources to trees in need? Their existence depends on the presence of a mature, stable forest with its humid microclimate and flow of nutrients. Tree diversity is essential, since monocultures are vulnerable to disease and disturbance. Therefore, the fungi may share resources in an effort to maintain diversity in the forest and ensure the long-term stability of the environment they enjoy. A diversity of fungi is also important, since different fungi provide different benefits to their hosts and thrive in different situations. The Wood Wide Web, with all of its natural connections, is beautiful from many angles. Perhaps our society could do worse than trying to emulate a system that has kept forests thriving on Earth for many millennia. The forest is quiet and still. 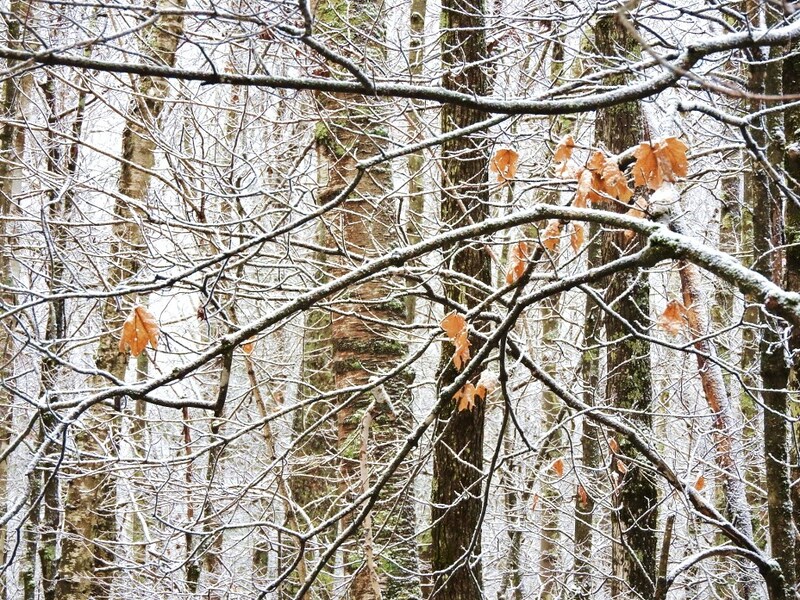 Overnight, our first snow transformed the woods from a sepia tone landscape to a black and white photo. Looking up, the lacy pattern of twigs embosses a network across the sky. When an icy shard catches me in the eye, I look back down, and am struck by the contrast. At the level of the forest floor, each trunk stands stoically alone, separated from its neighbors by a barren expanse of white. The reality is quite the opposite. At the level of twigs, trees are separate. To avoid competition for sunlight, they tend to grow away from one another, each seeking their own personal bubble. Occasionally, two trunks or two branches will miscalculate and intersect to squeak in the wind, or groan as scar tissue melds them together until death do they part. The real connections, though, happen beneath the duff—almost beneath our notice. Unlike the twigs, who studiously pretend to ignore each other unless forced to mingle, the miles of roots intersect regularly underground in their search for water and nutrients. When roots of the same or closely related species meet under the right conditions, they fuse together. This grafting requires that tree roots be sufficiently large; be in prolonged contact with each other under pressure that crushes their “skin”; and have sufficient moisture. Once the subterranean stars align, the grafted roots can transfer sugars, water, minerals, and chemical signals from tree to tree. This connectivity creates stability for the forest at many levels. On a physical level, the interwoven tangle of roots provides stability in windstorms. Imagine yourself alone, feet tight together, being pushed. Either you fall over, or your “trunk” splits and you step forward for stability. If you stand with a wide base, or link limbs with friends, you can withstand more force. As trees toss in a gale, their own spreading roots provide a stable base. But it doesn’t stop there. Their roots are connected to their neighbors’ roots, and their collective base is as wide as the entire forest. That entire forest is important. Together, all the trees create a microclimate: their very own ecosystem that buffers wind, stays cooler in the summer, and holds moisture at multiple levels. This microclimate is so important that it might even be worthwhile for well-located trees—those with ample access to water, nutrients, and sunlight—to redistribute those resources among weaker trees and prolong their lives. The partnership would serve to maintain stand integrity against pests, disease, and disruption of the microclimate. It might also maximize use of resources by allowing all trees to grow at an ideal rate, instead of having a few wealthy trees hoard resources they can’t immediately use while weaker trees slow their growth in response to scarcity. The network of grafted roots facilitates that sharing. This cooperative community of the grafted root network might confer several additional benefits on its members. For one, it is mostly trees of the same (or sometimes closely related) species that graft at their roots. This means that when stronger trees help weaker ones, they are still focusing on the survival of their own species. The resulting healthy neighbors may become a source of genetic diversity when pollen flies in spring. In addition, by helping weaker neighbors, the stronger trees maintain an “enemy” they know, and prevent the establishment of an unknown competitor who might eventually reduce their access to sunlight or water. Finally, when a tree dies, its roots can persist and continue contributing to the community. This is no small inheritance in a tree’s constant search for resources. Although the orphaned roots can’t deliver sugars from their own crown anymore, they can bring up nutrients and water in exchange for maintenance by the community. We can see the result of this exchange in the existence of living stumps. Although not every stump will continue to grow, I have occasionally observed new scar tissue forming on the cut surface. This is evidence that, while its crown is gone, the cut tree’s root system is still well-connected and active. In an even more remarkable example of network support, small redwood, spruce, and balsam fir trees can be albino. Their needles are ghostly pale, and contain no chlorophyll. All their sugar, then, must come from other trees, intravenously fed through their roots. This period between Thanksgiving and the New Year—when we open our checkbooks to share resources with those in our community who have less, and donate to organizations that we feel will support our favored microclimate—has many parallels to the forest. While we may sometimes feel like stoic individuals, an interwoven community is hidden just out of sight.